This case illustrates the importance of public (third party) rights to enforce conservation laws where government regulators refuse to act. The background is explained in an affidavit of Dr Carol Booth, a conservationist who brought the case. The Yardley Case in the Queensland Planning and Environment Court in 2006-2008. 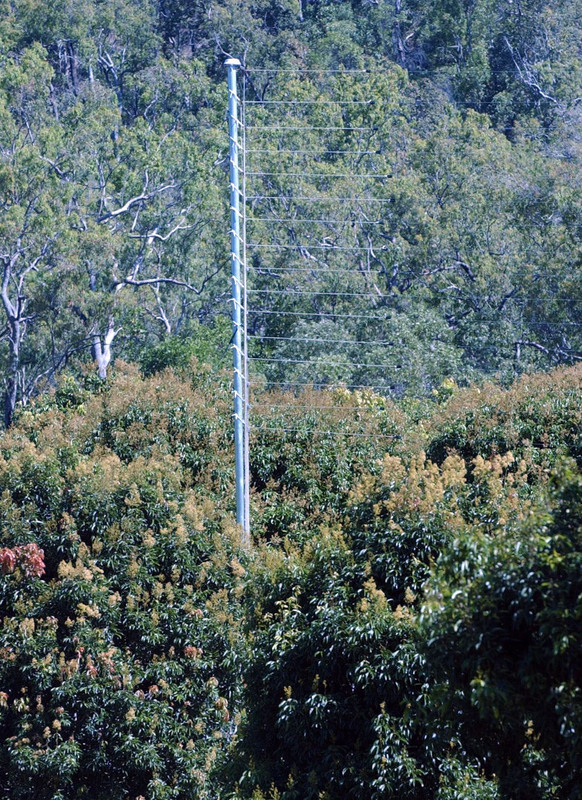 This case involved the operation of an electric grid on a property north of Townsville operated by a company, Frippery Pty Ltd.
A picture of the entrance to the farm and part of the electric grid are shown on the right of this page. The horizonal wires from the pole were electrified to form the electric grid used to electrocute flying-foxes that collided with it at night. 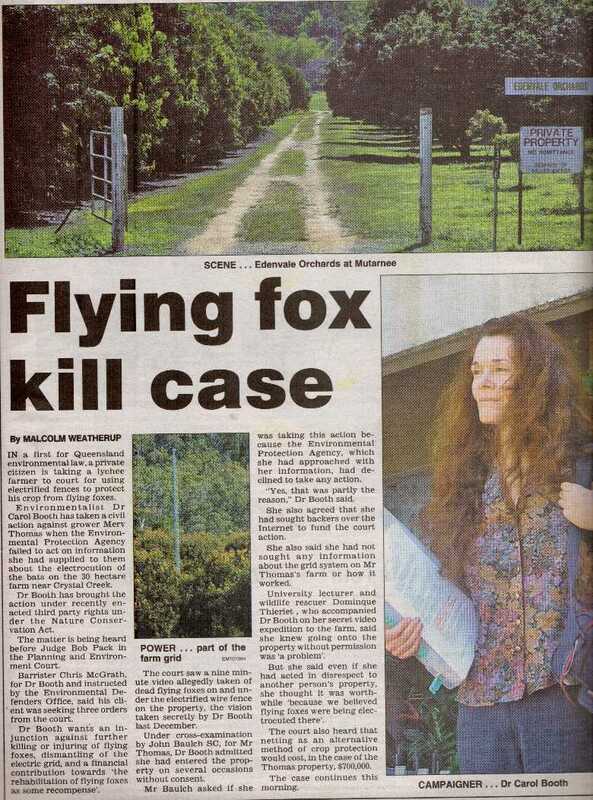 As explained in her affidavit, in 2003 Dr Booth investigated the killing of flying foxes on the farm and complained about this to the government agency responsible for enforcing the Nature Conservation Act 1992 (Qld), under which flying foxes are protected. When QPWS failed to take action, Dr Booth brought the proceedings in the Queensland Planning and Environment Court under open standing provided in the Nature Conservation Act for proceedings to restrain offences against the Act. At the first trial in 2005 in Townsville, Pack DCJ dismissed the application. This decision was overturned on appeal and the Court of Appeal ordered the case be re-heard by a different judge. The hearing of the re-trial was transferred to Brisbane. 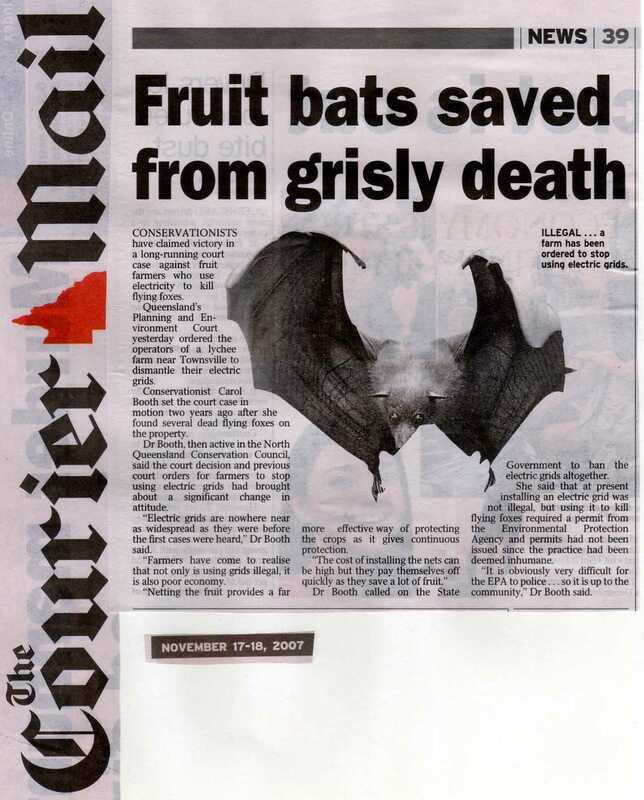 At the second trial in 2007 in Brisbane, Robin QC DCJ granted the application and ordered the grids be dismantled. An application for leave to appeal against this decision was dismissed for failing to comply with the Court of Appeal’s directions on the conduct of the application. In 2008 contempt proceedings were lodged for an alleged failure to comply with the Court’s order to dismantle the electric grids. The respondents were found guilty of contempt and fined $5000.